Julia Adhiambo. Age 41. I can now read books and my Bible much better. Emanual Emusolo. Age 56. I am a teacher. These glasses will help me a great deal in teaching and studying. I have a hard time reading in dim light. I like to read my Bible and this will be a big help. 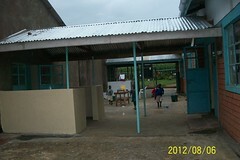 Eldon, Tony, Ed and their helpers completed a project to run water to the LSA school for drinking and hand washing. A drinking fountain was made. Tables and cabinets for the school as well. And some cool chairs by Eldon and Phyllis Yoder.